Multi-Strand Red Coral & Moonstone Bracelet in 18k Yellow Gold. Made in Italy by Mattio Mazza. 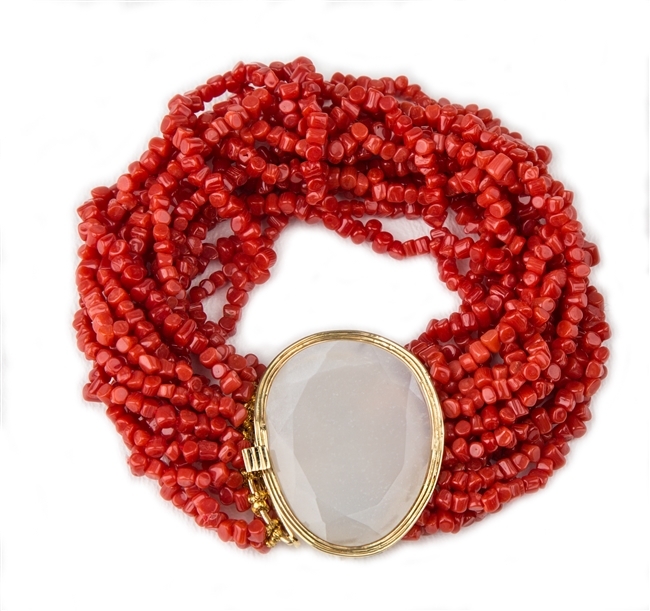 Multi-strand Red Coral designer Bracelet with a Moonstone Brooch at the closure. The faceted Gemstone is framed in 18K Yellow Gold and holds a locking clasp. Made in Italy by Mattio Mazza. Fits a 7" to 8" wrist. Clasp with Moonstone is 1 3/8" long X 1 1/8" wide.